– 2007: Jean Todt announces Kimi at Ferrari, and changes career to stand-up comedy!! Following the retirement of Michael Schumacher, on this day, Todt declared the new partnership of Felipe Massa and Kimi Raikkonen would be treated alike. For anyone with a non myopic view of Ferrari, the subtle undertones of this quote will confirm exactly what the Schumacher era at Ferrari meant. For all the haters of the red Mafia , they will twist everything to their way of understanding irrespective of what is written. In most countries, history books are tools sponsored by the national governments to foster patriotism to the motherland. These books often omit historic ‘facts’ to allow the heritage to be viewed in a favourable light. In Japan, for example, the Nanking Massacre has been removed from the texts completely and even their participation in WW II is barely mentioned. This form of propaganda is also used within Formula One circles to create any impression a writer or journalist wishes to paint. Ferrari’s history dates back to the early twentieth century, and their history incorporates both single seater and sports-car racing. This is an important distinction as previous to the growth of Formula One – as the foremost motor-sport in the world – sports car racing dominated the headlines. Le Mans, the Mille Miglia, the Targa Florio and Daytona all vied with Monaco as the most famous races in the world. Ferrari is a historic tapestry of beautiful cars, brave men and tragedy as well. Champions such as Nuvolari, Ascari, Fangio, Hawthorn, Hill, Surtees, Lauda and Scheckter received no additional support than their team-mates. They had to prove their ability within the team and sometimes – upon the orders of Enzo – they would receive less than optimum equipment; all in the name of the glory of Ferrari. No driver was allowed to become bigger than the team. In 1991, after three years in the doldrums, the Fiat empire placed the charismatic Luca Di Montezemolo in charge. He had worked with Ferrari in the mid 70’s and understood the legend better than anyone. Upon a suggestion from Bernie Ecclestone, he hired Jean Todt in 1993 to turn Ferrari around and subsequently he hired Schumacher, Brawn and Byrne. The problem with this sort of history is that depending on your source, Todt was either the most brilliant of managers, turning around an ailing behemoth into the yardstick which all teams would be measured by or he was the dictator of a team of charlatans who’s win at all costs mentality re-wrote a glorious history. 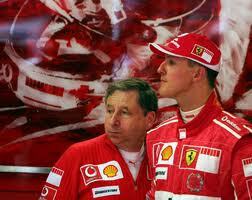 Todt and Schumacher shared an almost paternal relationship which countered the very essence of sportsmanship. Irrespective of what was supposedly written into contracts, the truth was Todt had engineered a team to respond to Schumacher’s every demand. It was only with Il Padrino resuming control that Ferrari returned to its sporting roots. No doubt, some will mention the 2010 German race as proof that Ferrari still embraced the No 1 and No 2 system, but as mentioned previously, this is merely for the people who refuse to believe that Ferrari existed before 1996. Those type of decisions are only possible because of the championship difference between the drivers. Ferrari have always been about the cars. The drivers are incidental. This is the reason why Todt lost his power struggle against LdM and left soon after. This is also why – despite being amongst the best of his generation – Alonso was swiftly rebuked back in the summer of 2013 following disparaging remarks made about Ferrari to the press. You just made me realize of Todt’s issues, Carlo. He being “at front” of Ferrari to respond to Schumacher’s every demand isn’t that different to beign at front of FIA to respond to, lets say Bernie’s every demand, or any other taller, stronger, more charismatic person. Little man syndrome they call it here in UK… could be. I’m guessing Rory Byrne being involved so heavily with this years design may make a bigger difference. With Allison and new recruits joining, the team will only get stronger. I think Kimi will enjoy winding up AL, he won’t care how he reacts but will enjoy pushing him. Yes, but I think Montezemolo allowed this because at the time Schumacher was conclusively the best available. Absolutely right, Todt and Cesare Fiorio were the two best rally bosses in the 80’s. It’s interesting looking back that these two men and Dave Richards at BAR could run a F1 team so well. Fiorio also ran the Lancia Le Mans program from the late 70’s with success. Fiorio was sacked by Ferrari at the start of 1991 because of internal politics, shortly after Luca joined the team and he signed Todt a couple of years later. Agree. Cesare was an excellent manager for Lancia. Their Delta S4 was the only real challenge to Todts 205 t16 E2 and was even more advanced with the twin charge approach. His responses after Henrys death were very decent and genuine, a true measure of the class of the guy. He was beset by politics in his time at Ferrari. A great manager, and a great guy. Sorry Carlo, going to disagree a little with you here. Todt was Bernie’s masterstroke for Ferrari. They’d gone far to long not winning either driver or constructors title. Luca said yes, eventually, but it was a no brainer as bruznic correctly points out. Luca is pants as figurehead of the team. Winning will only start to happen regularly after he leaves. 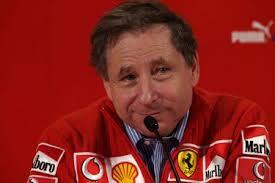 Todt made Ferrari successful, period. He built the super team and kept it in check. Luca had very little to do with it. And his ego helped break it up. Todt is sometimes jokingly called Napoleon. One of his sayings is “give me lucky generals”. Luca falls into this category. And as time goes by this becomes more apparent. He also said “in politics stupidity is not a handicap”. Again, this is becoming more evident with each hysterical utterance. He’ll retire soon enough. Thankful time catches up with all of us eventually. Hopefully John steps into his shoes and the team can take a more measured approach to F1 and start reaching its potential. As long as Luca stays this isn’t possible. As always, thanks for the article. And happy new year to you, my friend.